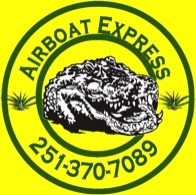 2017 Airboat Express, LLC. All Rights Reserved. Local 15 News featured us in their “Taren It Up” segment, Taren Reed visited us for a tour and we were featured on their show. Check out the video below. Journalist Michelle Matthews also visited us for a tour; She wrote two stories about us. One about our business and the services we provide in the beautiful Mobile-Tensaw Delta and the second about our marriage to each other and to our business. She did a great job! Check it out below.